Black currant tree grows extensively in deciduous or mixed dry forests in tropical parts of Central and East Asia starting from India to Papau New Guinea. This tree can even also be seen in North Australia. 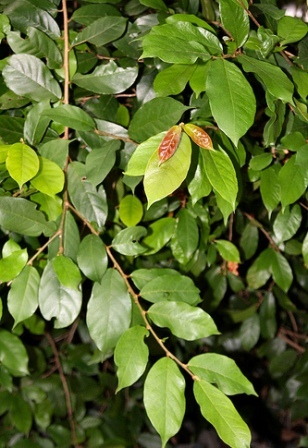 A small to medium tree upto 20 m tall; young twigs pubescent. Leaves oblong, more rarely ovate or obovate, (2-)3-7(-16) × (2-)3-5(-9) cm, papery to thinly leathery, pubescent to glabrous especially adaxially, often only major veins and margin pubescent, dull or shiny adaxially, dull abaxially, drying olive green to reddish green, base rounded to cordate, rarely obtuse, apex rounded, more rarely obtuse or acute, sometimes mucronate or retuse; domatia sometimes present; midvein flat adaxially, lateral veins 5-7 pairs, tertiary veins reticulate to weakly percurrent. Inflorescences axillary and terminal, axes reddish pubescent, males 4-8 cm, 10-20-branched, females 2-3 cm, (1-)10-20-branched; fruiting 4-7 cm. Male flowers sessile; sepals (4 or)5(-7), free, 0.5-1 mm, deltoid to oblong, pubescent outside, ± glabrous inside, apex acute to obtuse; disk consisting of 4-7 free alternistaminal obconical lobes, pubescent; stamens (4 or)5(-7), 2-2.5 mm; rudimentary ovary obconical. Female including fruiting pedicels 0-1 mm; sepals as in male; disk glabrous to pubescent especially at margin; ovary pubescent; stigmas (2 or)3(-5). Fruit an ellipsoid drupe, laterally compressed, 3-4(-5) × 2.5-3(-3.5) mm, sparsely pubescent; style terminal to more rarely subterminal; fruits borne on spike and ripen over a period of a few weeks and therefore harvested in more than one picking; fruits taste sour due to dominance by acids in spite of the presence of sugar. Though the fruits taste sour but still these are eaten locally. The taste, particularly the degree of sourness might vary from place to place. These can be used for making jam or jelly because of high pectin content. 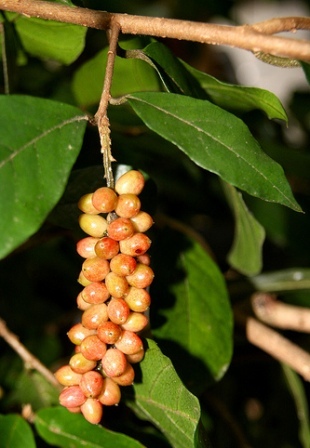 The fruits are also used to season meat and fish preparations in the Philippines. The leaves are also sour in taste. These are used for flavouring. 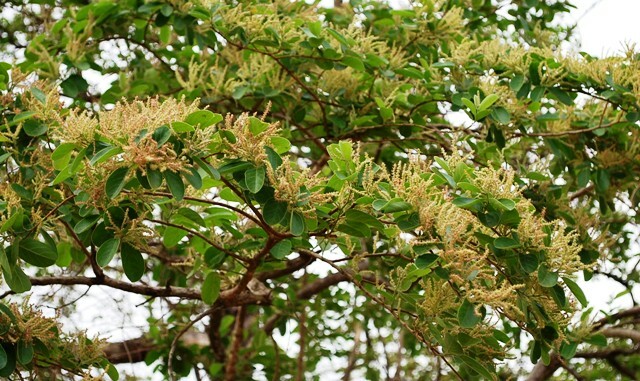 The leaves are used as a medicine for headaches; the stem is used as a medicine to stimulate the menstrual flow. The fruit is eaten locally or used as a purgative.